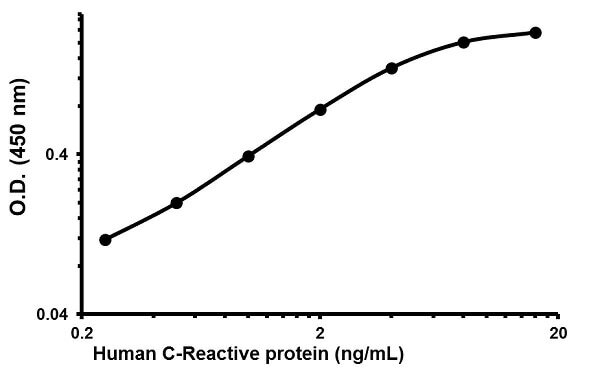 Abcam’s C Reactive Protein (PTX1) Human in vitro ELISA (Enzyme-Linked Immunosorbent Assay) kit is designed for the quantitative measurement of C Reactive Protein concentrations in Human plasma, serum, saliva, milk, urine and cell culture supernatants. A C Reactive Protein specific antibody has been precoated onto 96-well plates and blocked. Standards or test samples are added to the wells and subsequently a C Reactive Protein specific biotinylated detection antibody is added and then followed by washing with wash buffer. Streptavidin-Peroxidase Conjugate is added and unbound conjugates are washed away with wash buffer. TMB is then used to visualize Streptavidin-Peroxidase enzymatic reaction. TMB is catalyzed by Streptavidin-Peroxidase to produce a blue color product that changes into yellow after adding acidic stop solution. The density of yellow coloration is directly proportional to the amount of C Reactive Protein captured in plate. Get results in 90 minutes with Human C Reactive Protein ELISA Kit (ab181416) from our SimpleStep ELISA® range. Our Abpromise guarantee covers the use of ab108826 in the following tested applications. Publishing research using ab108826? Please let us know so that we can cite the reference in this datasheet. 1. According to your manual, page 17- Assay Procedure 13.11- We should read the absorbance at 450 nm. But if wavelength correction is available, we could subtract the readings at 570 nm from those 450 nm. We do have a microplate reader, wavelength correction available but it does not have a wavelength value of 570 nm. Do you have any way/s to deal with this problem or do you have any suggestion/s rather than having a 570 nm wavelength for the wavelength correction? 2. If we will be buying the kit, how will we receive it? 3. In the Assay Preparation, page 7, 9.1- 1X Diluent M, After we dilute the Diluent M, we should still store it for 1 month before using it or we can use it after we dilute it? 4. From the Data Analysis, page 20- Linearity of Dilution- May I just ask if you also have Average % Expected Value for Urine Specimens, because according to your manual you indicate Plasma Dilution and Serum Dilution only. 1. Your software may have a way to adjust the correction wavelength, or you can run it without the correction factor. The 570 wave length is subtracted to reduce the background noise and lower the OD. If you are unable to do so on the reader/software, then they can assume the blank (0 pt of the standard curve) represents the background noise and subtract the average of that OD from the OD of each well of the plate. 3. Diluent M: Once diluted, diluent M is stable for up to 1 month at 4oC so we recommend to use it within 1 month. If you don't want to use up all the 1X diluent M within one month, you can take out just some of the 10X stock solution to prepare. Please read through the protocol book carefully for storage instructions for kit components once they are reconstituted as this may be different from above. 4. For uriine samples: Collect urine using sample tube. Centrifuge samples at 800 x g for 10 minutes and assay. Samples can be stored at -20°C or below for up to 3 months. Avoid repeated freeze-thaw cycles. However, as it is a sample that needs to be run undiluted, we do not provide linearity data for it. I searched for an ELISA kit that can be used in testing urine and based on the results that came out, your company has a human ELISA kit that tests urine and other body fluids. And it is the ab108826- C- Reactive Protein ( PTX1) Human ELISA Kit. May I just ask if this kit can test urine because base from your previous reply you told me that you don't have a kit that tests Urine C- Reactive Protein. Thank you very much! I checked the details and can confirm that C Reactive Protein (PTX1) Human ELISA Kit ab108826 has been tested and covered by the guarantee for use in urine samples. Our apologies for any confusion. I was not able to find any literature to confirm the level of C Reactive Protein (PTX1) in urine. I contacted the laboratories in this case and they said they tested multiple samples with this kit and observed a great difference between samples (example: female vs male). The average value is around 0.4 ng/ml but they observed much lower and much higher values as well. They used samples with endogenous C Reactive Protein. I was wondering if you could help me – We’re coming up on the time when we’ll actually order these kits and we want to make sure that we’ve got everything lined up so that testing goes smoothly. As I am not quite sure when to locate this information, so if you could help me out here, I would really appreciated it. Thank you for your enquiry regarding these kits. I would suggest reading through the Protocol Booklets for each of these kits provided on the product datasheets. These documents contain specific information about the sample types, sample preparations, protocol, instruments and equipment required for the assays. Whole blood samples are not used to test these kits mainly serum or plasma instead. As you are aware our Abpromise indicates, in the event that a product is not functioning in the applications/species cited on the product data sheet (and the problem has been reported within 6 months of purchase) we will happily offer a credit note/refund to the value of the product purchased. Therefore please advsie yiur customer to use teh product as soon as possible after purchase to make sure that we can provide the best technical support within the guarantee period. The specific storage instructions can also be found on the product datasheets. It is not clear if the customer would like to use these products in serum from normal, or drug treated or diseased (pathological conditions) individuals. We would suggest optimizing the assay and using standards. Let me know if you haveany further questions. Thank you for your enquiry. I can confirm that both these kits ab46042 and ab108826 should be suitable for use with saliva samples. I can confirm that kit ab108826 has been tested on saliva samples, We suggest to use saliva samples at 1x (no dilution) for this kit. We would suggest ab46042 should be suitable for saliva samples. However, this has not been specifically tested. Therefore, we are able to offer a discount for this kit in return for agreement to submit an Abreview with the data. I am currently waiting to hear from my colleagues how much of a discount we can offer and will be in touch with you as soon as possible. I hope this will be helpful. If you have any further questions, please do let me know. I will be in touch again regarding ab46052.